I am looking for ideas on how to measure water level in a bore well using arduino boards, and which boards and sensors I need to use. What is bore well for? if it is for pet you could use this one. 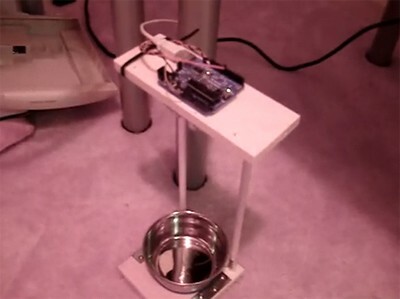 ultrasonic cat dish, measure cat dish water/food level. What are the approximate depth and diameter of the well? It's water Borewell, the depth is approx 420ft, and 6 inch diameter. I would like to know what is the water level in my Borewell and keep an eye on how much water is available etc.. The ultrasonic I have won't wait for returns that come from more than 4.5 to 5 meters. If you make a loud clap at the top of the well, can you hear an echo from the bottom? You could use a pressure sensor. They are quit expensive (>100$). My first thought was to use a conduction sensor at various levels to detect whether the water was up to that level. But at that depth, the length of cable will be a concern, especially given that you would need lots of them for the different levels. In this case I think the most straight forward approach would probably be to lower a weighted float down the well so that it settled at water level, and measure the length of line supporting it. That ends up being a turn-counting problem for the drum that the line is spooled on, and that seems like a reasonably solvable problem. While not simple there is one method I've seen used in industry. It consisted of a servo motor arrangement that operated a reel assembly that would lower a sealed metal float. The whole servo plate assemble rested on a strain gage that measured the weight of the reel/float/line assembly, while a reel encoder/counter would tick off how much line was being lowered. The device would continue lowering the line down the well while continuing to measure the weight of the device and when the float hit the water level of the well the strain on the line would be significantly less and would stop the reel and then the depth of the water interface could be calculated from the amount of line that had been let out. Sounds a little complex, but when you think about it, it is not that different then the old time sailing days when crew threw a weighted line overboard and let out line until they could detect hitting bottom and thus knowing the depth of the water by the amount of line let out. hi, a 420 ft deep well must be feeding from an aquifier far below. What is the distance down to top of water in the usual situation?? If it's 300 feet down and you want to use ultrasonic, you might make a platform you can lower on a long cable, and get the ultrasonic down lower. And you think that would work looking down a 6" pipe hole going down hundreds of feet? Have you looked at industrial liquid level measuring devices for ideas? Is power available at the well? how often does the well level need to be measured? is the well head open for insertion of devices? If just warning point is needed, We just need a pair 315MHz/433MHz Arduino. Use a pair 315MHz/433MHz Arduino, put transmitter into IP 68 enclosure and fix it on warning point . if water cover it then RF will be off, otherwise it is on. Pro. wireless, dirty cheap, Arduino centric, few USD. Con. only give one warning point. B.T.W. This works better in salt water than fresh water, but fresh water should work. Easy, It is just plan. Selection right is still back to OP. He might upgrade pipe to allow microwave go through. Pro. wireless, give you measurement. Con. Chip level integration skill.